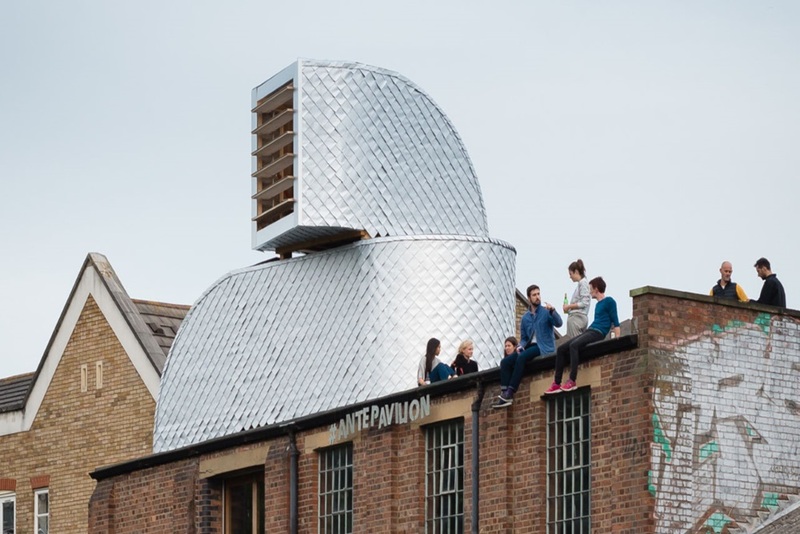 PUP Architects, a London-based architecture firm, created the H-VAC, a pavilion disguised as a large air duct to be installed on top of buildings. The two-story H-VAC was meant to prompt the local planning authorities of east London to reconsider many of the area’s laws regarding unused rooftop space. The team discovered a loop-hole in the law that stated they could build something on a dwelling on a rooftop as long as it remained two stories tall and it was a service structure, hence the appearance of looking like an air duct. The inside can comfortable fit six people sitting, along with a small garden area with the roof providing a view of the river across the way. The lower part of H-VAC leads to a staircase below to the actual building where an artist resides. The H-VAC was the winner of the inaugural Antepavilion International Competition and opens to the public from September 16 to the 17.